Everything you need to feed, treat, keep busy and train your Lovebird. Parrot Essentials has everything you need to keep your Lovebird healthy & happy. Choose from healthy food & treats. stylish & spacious cages, safe toys, accessories and supplement suitable for Lovebirds. There are many different types of Lovebirds. More specifically, there are nine separate sub-species of these little parrots. Each of them carrying their own distinct traits and characteristics. Typically, the most common pet species are the Peach-Faced Lovebird and Masked Lovebird. 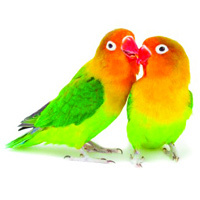 Whatever Lovebird you have, you’re in for a fun and entertaining, pet owning experience. Assuming you’re a Lovebird owner, you know that these little birds are quite active. With that being said, it’s very important to have a selection of toys on hand. We carry coloured and interactive toys, foraging cubes, and even multipack toys, to ensure your Lovebird will be in for a fun day. Our selection of toys are made from the best and bird-friendly materials available on the market! In addition to the topic of keeping your bird active, we recommend investing in a stand. Stands make it possible for your bird to be near you, outside of their cage. This not only creates special time with you and your Lovebird, but ensures they get freedom and plenty of play time. This is made possible with stands like our window perch or activity gym style stands. Browse our wonderful line of lovebird cages. With over a dozen of these beautifully crafted designs, your lovebirds will have the best home any bird could have. Made from safe and durable materials, these cages come in different sizes and fit any lovebird’s needs. We also offer a good selection of travelling cages suitable for lovebirds. When it comes to food, treats, and supplements for your Lovebird, look no further. Parrot Essentials carries a great assortment of healthy and nutritious, one-of-a-kind line of feeds that are made especially by experts for your Lovebird’s needs. Choose from foods like pellet berries, premium seed mixes, and more. When it comes to treats, ours come in fun sprays, adorable jelly cups, or honey treat rings that are sure to keep your beloved Lovebird excited. When your Lovebird is needing an extra healthy boost, try our supplements that are sure to bring the nutritional requirements that every Lovebird needs. Our supplements are specially formulated and come in easy digestible form, ensuring easy and safe daily doses. In search of accessories and extras for you Lovebird? No problem. Our collection of accessories feature not only fun cage accessories such as perches, but other bird essentials such as fleece bird blankets or functional snuggle sacks, cage cleaning supplies, and much more!